Transplant Surgeon Harrison Pollinger, DO, FACS, sat down with Shedding Light to talk about his practice, technological advances in transplant surgery, and why he chose Enova LED surgical headlights to use during all of his open surgeries. Dr. Pollinger: I am a multi-organ transplant surgeon and the surgical director of the liver transplant program at Piedmont Transplant Institute in Atlanta, Georgia. My specialties are transplant surgery including liver, kidney and pancreatic transplantation and robotic surgery. I chose transplant surgery as a practice focus because it is one of the only surgical fields where, rather than removing things for disease and pathology, you’re replacing or adding new healthy organs to patients. It is quite rewarding. Shedding Light: How has practice changed since you started and what technology would you say has advanced transplant surgery? Dr. Pollinger: I’ve been at Piedmont for six years and I’d say we are seeing patients who are sicker and who require more complex operations. The most significant advancement is the incorporation of robotics. It is minimally invasive for liver ressection and is a major benefit for living kidney donors. The precision of robotic surgery is less traumatic surgery for the donor; they recover faster and require less pain medication post-operatively. There are very few and select programs nationally that have incorporated robotics into their live donor nephrectomy program. Piedmont is currently the only transplant program in Georgia to offer this procedure. Shedding Light: How long have you had your D-200 headlight and how did you first hear about Enova? Dr. Pollinger: I’ve had my D-200 for about nine months. The headlights available in the healthcare system were too heavy to wear for extended periods of time. Liver transplants can take six to seven hours to complete and I was experiencing neck pain during and after surgery. I wanted something better and found Enova Illumination’s website online. I’ve had my D-200 for about nine months. The headlights available in the healthcare system were too heavy to wear for extended periods of time. Liver transplants can take six to seven hours to complete and I was experiencing neck pain during and after surgery. I wanted something better and found Enova Illumination’s website online. 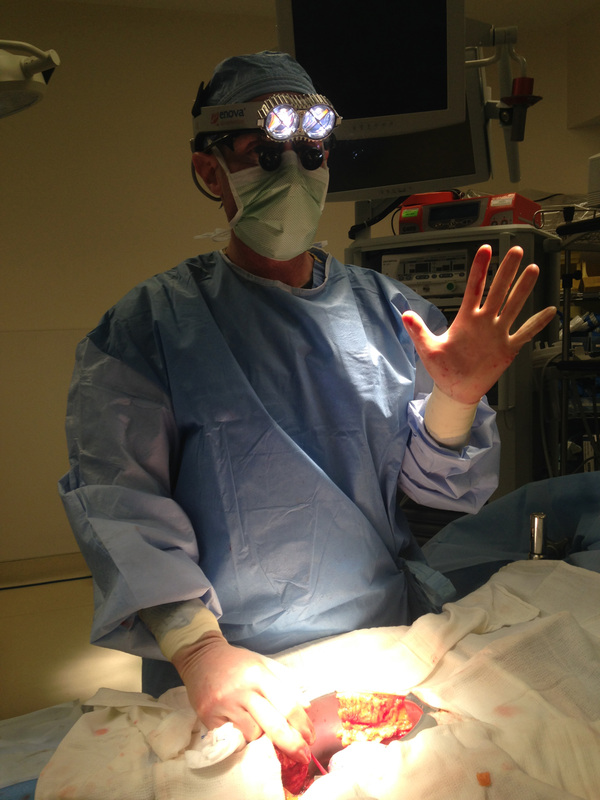 Dr. Pollinger: I use my surgical headlight for every open surgery I perform and I conduct between three and four transplant surgeries each week. Shedding Light: What do you like best about your Iris D-200 LED surgical headlight? Dr. Pollinger: I’ve never been a fan of how fiber optic headlights tether you to a power source; the portability of the D-200 is nice. The brightness of the D-200, as I’ve said, is more than adequate and the headlight is ergonomically much better than what I’d been using. I’m also impressed with how long the battery pack lasts, which for me, is an average of six hours with each use. Dr. Pollinger: Yes, I have. No one else here has one and it looks different from what is provided by the hospital. I’ve gotten many questions and always encourage colleagues to look at Enova headlights. I’m very happy with mine. *Enova’s D-200 LED surgical headlight has over 200,000 lux illumination and provides pure white light at 6100 degrees Kelvin. More videos are planned for publishing! To stay informed, be sure to subscribe from the Enova YouTube Channel.